What are Voluntary Benefits? | Mercer U.S.
You have a pretty solid benefits package … you think. Employees have a choice of health insurance plans, and most have socked away some money in the 401(k) program. However, there are little “caution” flags popping up. Too many employees are withdrawing their 401(k) funds early, and too few are taking advantage of the consumer-directed health plan (CDHP). You wonder if they could use some financial education. You’ve also had some job candidates asking about voluntary benefits that their current employers offer but you don’t. While financial stress is a common theme, across generations employees have different benefit needs. Younger employees are overloaded with student loan debt, older employees are worried about providing for their children’s educations and saving for retirement. Voluntary benefits align with employee financial wellness and provide other features to meet employees’ needs including group savings and discounts and education and support tools. Mercer’s National Survey found that 60% of employers say they are offering VB as a way to reduce employee financial stress. Voluntary benefits that protect your employees financially can be a very worthwhile investment. When employees are stressed with their financial situation, that stress interferes with their ability to focus and be productive at work. Can I Do More To Help My Employees With Their Health Insurance Costs? If you’re offering a consumer-directed health plans (CDHP) to your employees, like the majority of mid-sized and large employers, you know it’s a double-edged sword. While these plans keep premiums down, they expose employees to more financial risk …. from several thousand to more than $10,000 in deductible costs per year. Supplemental health insurance can help employees close that gap. This type of product offsets deductibles, coinsurance and other out-of-pocket costs, helping employees avoid debt that might take years to pay off. Look for a full-service provider who can manage the program for you and provide an exceptional enrollment experience for employees. Ideally, your voluntary benefits should be integrated onto the same administrative platform as your core benefits to make enrollment quick and easy. Mercer’s Inside Employees’ Minds survey found that for about two-thirds of their benefits are as important as pay in choosing an employer. Providing a strategic benefits program has become more critical than ever. 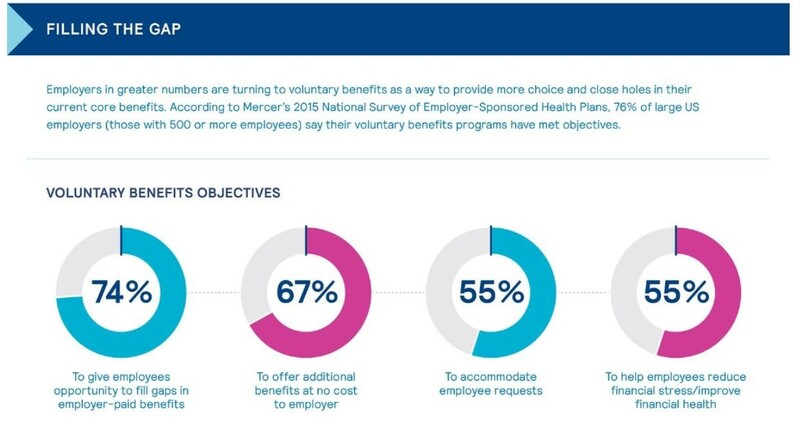 Voluntary benefits can help you recruit the top-tier talent you need ... and protect your employees in the long run.